What is a Conservation Voter? How Green is Your Governor? 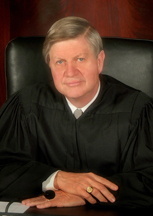 Justice Clifford Taylor was appointed to the Michigan Supreme Court in 1997 by Gov. John Engler (R). He was elected to the Court in 2000 and served as Chief Justice from 2005-2008. His term expired in 2008, and he was not re-elected. Justice Taylor graduated from the University of Michigan and George Washington University Law School. He served in the Navy for three years before becoming an assistant prosecuting attorney for Ingham County. He was in private practice for 20 years with the Denfield, Timmer and Taylor law firm before Gov. Engler appointed him to the Michigan Court of Appeals in 1992.